When someone we love is suffering, why do we suffer as well? Does love have to mean that when someone is suffering we suffer as well? Ajahn Brahm talks about how Buddhists deal with the suffering of loved ones. In this talk Ajahn offers some skillful means of responses and teaches us how to have real love, instead of attachment. Ajahn Brahm reflects on the way to end conflict within yourself, between people and between you and your world. Ajahn tells us why we have so many conflicts and reveals how we can gain more peace and harmony. Venerable JR spoke on just letting it be tonight. Let the thoughts come and let them go, don't engage them, just let it be and be happy. After a guided beginners meditation Venerable was happy to do a Q&A session. Ajahn Brahm talks about devotional practises and rituals in Buddhism and how we must be very careful we are not devoted to the rituals themselves or in his words ‘not devoted to the container, but to the content’. Ajahn explains the importance of doing these practises with context that is an understanding of what the practise means and why you are doing it. Ajahn Brahm talks about the value of friendships and offers practical advice on how to strengthen and build up our friendships and create a sense of community. Ajahn takes a look at the Buddhist way of dealing with the loneliness in this world. Ajahn Brahmali gives an introduction about how sila, contentment and support in your spiritual life help to remove meditation obstacles and ensure good progress. 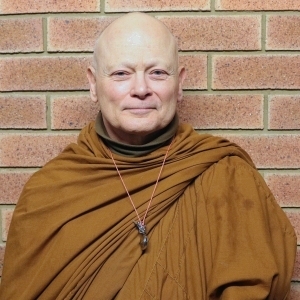 Ajahn Brahmali gives a talk on the importance of the Sangha or monastic community in Buddhism. Ajahn considers the Sangha’s purpose or role in Buddhism, as well as why they matter and the Buddha’s reasons for making the monastic order. Ajahn Brahmali elaborates on the Buddha's teaching that it is attachment that causes suffering and letting go is the cause for happiness. Ajahn points out that attachments are part and parcel of being a human being. Ajahn explains why attachments lead to suffering and how we can remove and reduce our attachments to that there is less suffering when impermanence comes round and tears these things away from us, which eventually it must do. In response to a question on how to stop getting angry when watching sport, Ajahn Brahm gives an insightful teaching on the problems caused by our dysfunctional way of looking at winning and losing and modern society’s obsession with competitions and separating people into winners and losers. 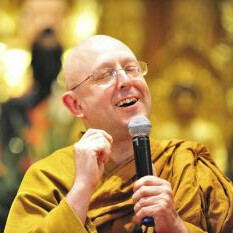 Ajahn kindly gives us the goods to help us overcome depression; our negative mind states. Bhante explains metta meditation, how it will affect every aspect of our daily lives before guiding us through a combined metta and breath meditation. After the guided meditation Bhante answered questions about the meditation then opened to general comments and questions. Bhante concluded the evening with stories that showed how love and kindness worked for Bhante G at Heathrow. Metta [loving kindness]. In Buddhist belief, this is a Brahma-vihara (divine abode) or an immeasurable that leads to a meditative state by being a counter to ill-will. It removes clinging to negative state of mind, by cultivating kindness unto all beings. 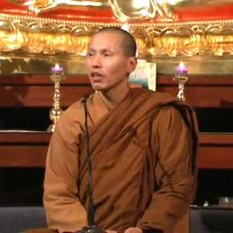 Ajahn Khemavaro, the Abbott of Wat Buddha Dhamma Monastery talks about how appreciation leads to contentment, stillness, peace, less doing and contentment can be used to developed wisdom. 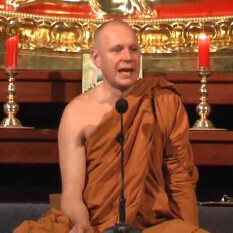 Ajahn also shares his experiences and reflections about what has happened in the last year and half while trying to re-establish Wat Buddha Dhamma as a Forest Monastery, and how things have changed since he was a disciple of Ajahn Brahm at Bodhinyana Monastery. Ajahn Brahm elaborates on one of the pillars of Buddhism: The Middle Way, pointing out that it is very easy to wander off on a path of too much harshness to your body and mind (asceticism) or too much indulgence. Ajahn starts off by reflecting upon his time as a young western monk in Thailand. How to deal with disasters, such as a recent oil spill in California. How to interpret this middle path as a way of dealing with the disasters of life, and the middle way between indulgence and asceticism. How to apply the Buddhist teachings to your daily life. Ajahn Brahm gives a guided meditation for advance meditators. Ajahn starts off by reminding us while meditating to stop trying to get somewhere and talks about the how the judgemental mind and conceit hinder our meditation progress. Ajahn Brahm reflects upon people’s entanglement with possessions, views & opinions and the past & future. Ajahn explains why and how we get entangled, as well as why and how we can let it go, so that we can live a much more peaceful, free existence. 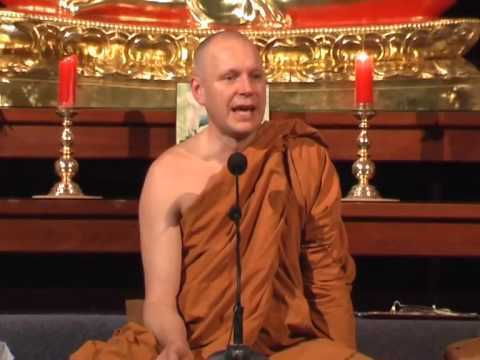 In this talk Ajahn also advises us how to let go of grief. On the actual day of Vesak (birth, enlightenment and passing away of the Buddha) in 2010, Ajahn Brahmali gives a teaching on the life and qualities of the Buddha and how his example can be an inspiration for our own practice. Ajahn reminds us that the person who sees the Buddha, also sees the Dhamma, and the person who sees the Dhamma, also sees the Buddha. Ajahn Brahm muses about a famous old saying coined by Thomas Gray: ignorance is bliss. Ajahn also looks at whether running away and ignoring the world brings peace and happy.